Researchers from the Tissue Engineering Resource Center at Tufts University report the creation of three-dimensional brain-like tissue that functions like and has structural features, including grey-white matter, similar to tissue in the rat brain and that can be kept alive in the lab for more than two months. The scientists have already used the material to study chemical and electrical changes that occur immediately following traumatic brain injury and, in a separate experiment, changes that occur in response to a drug. The tissue could provide a superior model for studying normal brain function as well as injury and disease, and could assist in the development of new treatments for brain dysfunction, according to David Kaplan, Ph.D., Stern Family Professor of Engineering at Tufts and director of the center. The research team published its study (“Bioengineered functional brain-like cortical tissue”) in Proceedings of the National Academy of Sciences. The National Institute of Biomedical Imaging and Bioengineering (NIBIB) is funding the work to establish innovative biomaterials and tissue engineering models. The key to generating the brain-like tissue was the creation of a novel composite structure that consisted of two biomaterials with different physical properties: a spongy scaffold made out of silk protein and a softer, collagen-based gel. The scaffold served as a structure onto which neurons could anchor themselves, and the gel encouraged axons to grow through it. To achieve grey-white matter compartmentalization, the researchers cut the spongy scaffold into a donut shape and populated it with rat neurons. They then filled the middle of the donut with the collagen-based gel, which subsequently permeated the scaffold. In just a few days, the neurons formed functional networks around the pores of the scaffold, and sent longer axon projections through the center gel to connect with neurons on the opposite side of the donut. The result was a distinct white matter region (containing mostly cellular projections, the axons) formed in the center of the donut that was separate from the surrounding grey matter (where the cell bodies were concentrated). 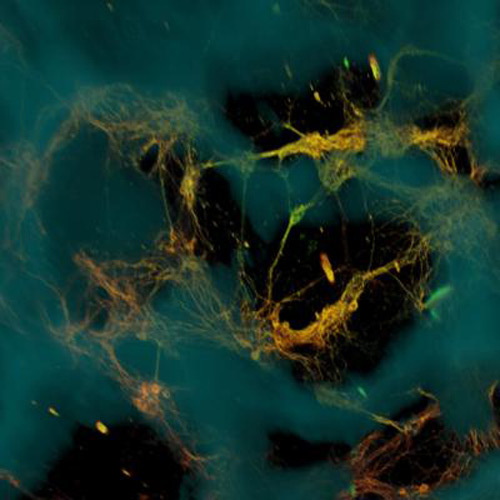 Over a period of several weeks, the researchers conducted experiments to determine the health and function of the neurons growing in their 3D brain-like tissue and to compare them with neurons grown in a collagen gel-only environment or in a 2D dish. The researchers found that the neurons in the 3D brain-like tissues had higher expression of genes involved in neuron growth and function. In addition, the neurons grown in the 3D brain-like tissue maintained stable metabolic activity for up to five weeks, while the health of neurons grown in the gel-only environment began to deteriorate within 24 hours. In regard to function, neurons in the 3D brain-like tissue exhibited electrical activity and responsiveness that mimic signals seen in the intact brain, including a typical electrophysiological response pattern to a neurotoxin. Dr. Kaplan and his team are looking into how they can make their tissue model more brain-like. In this recent report, the researchers demonstrated that they can modify their donut scaffold so that it consists of six concentric rings, each able to be populated with different types of neurons. Such an arrangement would mimic the six layers of the human brain cortex, in which different types of neurons exist. As part of the funding agreement for the Tissue Engineering Resource Center, NIBIB requires that new technologies generated at the center be shared with the greater biomedical research community. “We look forward to building collaborations with other labs that want to build on this tissue model,” added Dr. Kaplan. Next articleDelete ApoE Gene, Set Back Alzheimer’s, and Preserve Brain Health?